In this article, you find out how to determine the processes, which decrease the battery life of your device. This can be performed using built-in functions or special software (namely, the GSam Battery monitor app). The power cell life is one of the main parameters of any gadget, and its duration often determines the purchase. However, the gadget does not always confirm the capacity, which is specified be the manufacturer. This characteristic depends on the capacity of the battery and on many other parameters, the main of which is the software you use. Clearly, the more your smartphone is in state of deep sleep, the bigger is its battery life. However, some applications can constantly awake your gadget and load the processor due to their functions or errors. This can be applied to both system processes and third-party programs. 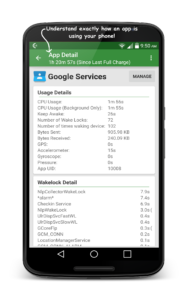 If your device discharges too quickly, the first thing to check is the Android battery monitor utility. You can find it in the settings of the phone (“Settings” – “Battery”). It provides a list of the biggest consumers of charge and general info about the power cell in the form of graphs and charts. Tap the desired name in the list to see the extended information about the app or process. The menu provides detailed battery consumption statistics, as well as energy saving tips. For example, on the screenshot below, we can see full information about “Currents” application (how long it was loading a processor and keeping it awake). After analyzing this data, you can make conclusions and either change the settings of the app or stop using it/delete. However, standard tools of Android OS do not provide complete data. If you desire to receive exhaustive information about the energy consumption on your smartphone, we recommend you to download one of the battery saving apps. The GSam Battery Monitor is considered to be among the best utilities of its kind. 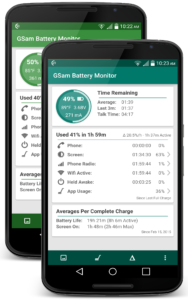 GSam Battery Monitor is a powerful system utility for Android, which is able to analyze the power cell performance and the impact of different processes on its life. This tool was created only for tracking purposes, so you will not find any optimization functions in it. The program can be downloaded via this link) . 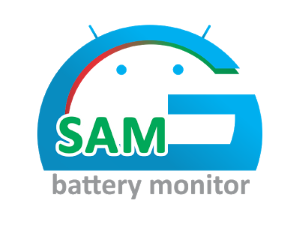 The GSam Battery Monitor Pro costs 2.49$. The main window of the application contains various information. The main chart displays percent of remaining charge, battery temperature, voltage and the amount of remaining charge in milliamps. On the right, you can see the remaining time to use your gadget. In the center of the screen, there is information about the percentage and minutes spent since the last charge. You can click any tab to see more detailed information. Click the first button at the bottom to open the “Charts” window. 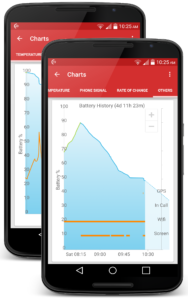 The Battery monitor app provides different graphs: battery temperature, level of the phone signal, changes tempo, power cell consumed by the processor, overall graph (GPS, call, screen, Wi-Fi, doze). Tap the second button at the bottom to find out what applications consume precious battery power. The apps can be sorted by CPU/sensor usage, wakelocks and kernel wakelocks, wake time. Choose any desired app to open a window containing usage and wakelock details, built-in processes and packages. Good news for Kindle Fire owners: developers created a similar application specifically for your devices! It can help with solving battery consumption problems on these Amazon devices. Before googling how to perform Kindle battery replacement, try downloading this app. 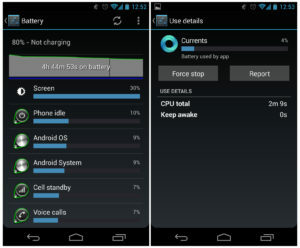 In this article, we were talking about battery consumption on Android devices. There are standard tools that help to analyze which app or service consumes the most, but many users all over the world use the best battery monitor app for this purpose. 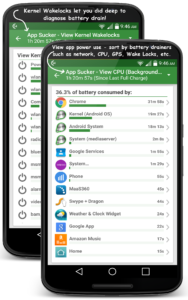 This qualitative and convenient application for Android and Kindle analyzes the battery consumption, gives you detailed statistics, runs stably, and shows the exact information.